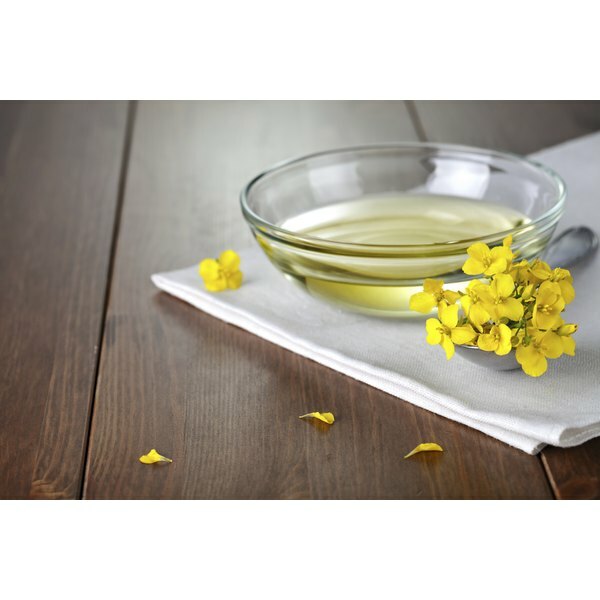 Rapeseed oil comes from a plant related to mustard, cabbage, broccoli, cauliflower and turnip, members of the Brassica family. Traditionally used as an industrial lubricant, an edible version -- marketed under the name canola oil -- was developed in the 1970s. The oil offers a neutral flavor that makes it useful for any number of cooking applications, from baking to sauteing to salad dressings. You might choose rapeseed oil because it has a relatively low saturated fat content -- just 7 percent compared to the 14 percent found in olive oil and 51 percent in butter. Rapeseed oil possesses a high smoke point, so it's a better option than olive oil for deep frying and other high-heat cooking. Some chefs seek out high-end versions of rapeseed oil to use just like artisanal olive oils. Use these versions of rapeseed oil as a finishing oil to be drizzled over salads or pasta, or as a dipping sauce for fresh bread. Top-end versions do come with a high price tag, though, and offer a subtle, cabbage-y flavor.